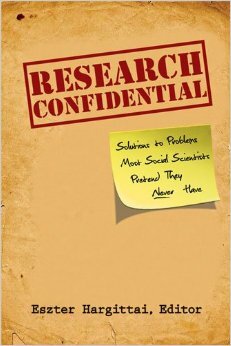 For social scientists starting their careers, creating research models that work is crucial. A new book suggests that they may be unaware of problems they face in part because scholars don’t share stories of what didn’t work on their projects, and how to deal with particular challenges. The essays in the collection are all by younger scholars, including the volume’s editor, Eszter Hargittai, an associate professor of communication studies at Northwestern University, a fellow at the Berkman Center for Internet & Society at Harvard University and a career advice columnist for Inside Higher Ed. Hargittai responded to questions about the book. Read the interview at Inside Higher Ed. More information can be found on the book’s website.